The following terminology applies to these Terms and Conditions, Privacy Statement and Disclaimer Notice and any or all Agreements: “Client”, “You” and “Your” refers to you, the person accessing this website and accepting Tunisia.com’s terms and conditions. “Tunisia.com”, “Ourselves”, “We” and “Us”, refers to our Tunisia.com. “Party”, “Parties”, or “Us”, refers to both the Client and ourselves, or either the Client or ourselves. All terms refer to the offer, acceptance and consideration of payment necessary to undertake the process of our assistance to the Client in the most appropriate manner, whether by formal meetings of a fixed duration, or any other means, for the express purpose of meeting the Client’s needs in respect of provision of Tunisia.com’s stated services/products, in accordance with and subject to, prevailing English Law. Any use of the above terminology or other words in the singular, plural, capitalisation and/or he/she or they, are taken as interchangeable and therefore as referring to same. Excludes all liability for damages arising out of or in connection with your use of this website. This includes, without limitation, direct loss, loss of business or profits (whether or not the loss of such profits was foreseeable, arose in the normal course of things or you have advised by Tunisia.com of the possibility of such potential loss), damage caused to your computer, computer software, systems and programs and the data thereon or any other direct or indirect, consequential and incidental damages. This Tunisia.com does not however exclude liability for death or personal injury caused by its negligence. The above exclusions and limitations apply only to the extent permitted by law. None of your statutory rights as a consumer are affected. We are not an estate agency or direct provider or professional services. The details of the properties and professional services available on this site are provided to us by third party estate agents and professionals for your information only. We do not verify the property details provided to us and therefore make no warranties or representations as to their accuracy or completeness. If you rely on these details, you do so at your own risk. We recommend that you check all property details with the advertising estate agent, or professional before making any decisions or taking any action in regards to a property or service advertised on our Site. Unless otherwise stated, the services featured on this website are available within the United Kingdom, or in relation to postings from the United Kingdom. All advertising is intended solely for the United Kingdom market. You are solely responsible for evaluating the fitness for a particular purpose of any downloads, programs and text available through this site. Redistribution or republication of any part of this site or its content is prohibited, including such by framing or other similar or any other means, without the express written consent of Tunisia.com. 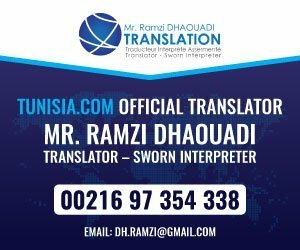 Tunisia.com does not warrant that the service from this site will be uninterrupted, timely or error free, although it is provided to the best ability. By using this service you thereby indemnify this Tunisia.com, its employees, agents and affiliates against any loss or damage, in whatever manner, howsoever caused. We do not monitor or review the content of other party’s websites which are linked to from this website. Opinions expressed or material appearing on such websites are not necessarily shared or endorsed by us and should not be regarded as the publisher of such opinions or material. Please be aware that we are not responsible for the privacy practices, or content, of these sites. We encourage our users to be aware when they leave our site & to read the privacy statements of these sites. You should evaluate the security and trustworthiness of any other site connected to this site or accessed through this site yourself, before disclosing any personal information to them. This Tunisia.com will not accept any responsibility for any loss or damage in whatever manner, howsoever caused, resulting from your disclosure to third parties of personal information. Copyright and other relevant intellectual property rights exists on all text relating to Tunisia.com’s services and the full content of this website. Tunisia.com’s logo is the property of Tunisia.com in the United Kingdom and other countries. We have different e-mail addresses for different queries. These, & other contact information, can be found on our Contact Us link on our website or via Tunisia.com literature or via Tunisia.com’s stated telephone, facsimile or mobile telephone numbers. The laws of England and Wales govern these terms and conditions. By accessing this website you consent to these terms and conditions and to the exclusive jurisdiction of the English courts in all disputes arising out of such access. If any of these terms are deemed invalid or unenforceable for any reason (including, but not limited to the exclusions and limitations set out above), then the invalid or unenforceable provision will be severed from these terms and the remaining terms will continue to apply. Failure of Tunisia.com to enforce any of the provisions set out in these Terms and Conditions and any Agreement, or failure to exercise any option to terminate, shall not be construed as waiver of such provisions and shall not affect the validity of these Terms and Conditions or of any Agreement or any part thereof, or the right thereafter to enforce each and every provision. These Terms and Conditions shall not be amended, modified, varied or supplemented except in writing and signed by duly authorised representatives of Tunisia.com.